Red dust rises, Brolga dances - a new dawn begins. their path guides our way. sky disappears, stars are revealed. - freshwater turns to salt. Woven leaf binds us, we are connected, we are one. we are stronger together as we determine our futures. 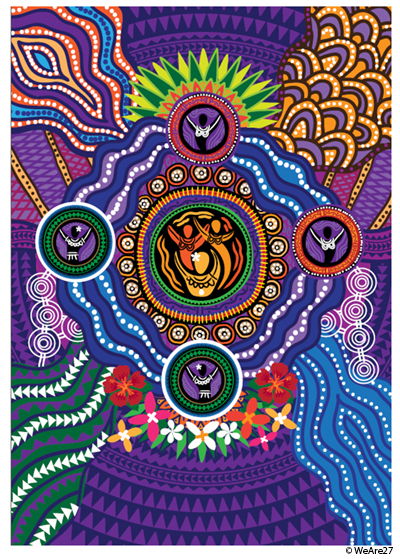 The Wiyi Yani U Thangani (Women's Voices) artwork depicts the journey of both Aboriginal and Torres Strait Islander Women and Girls and their rights to security and success. The leadership roles that those who have come before us have played in the past and the roles that Women and Girls continue to play today and aspire to in the future. Within their families, their communities, the nation and the world. Pathways leading in from the top of the artwork depict the journeys of the Women and Girls who have come before us - overcoming many challenges. 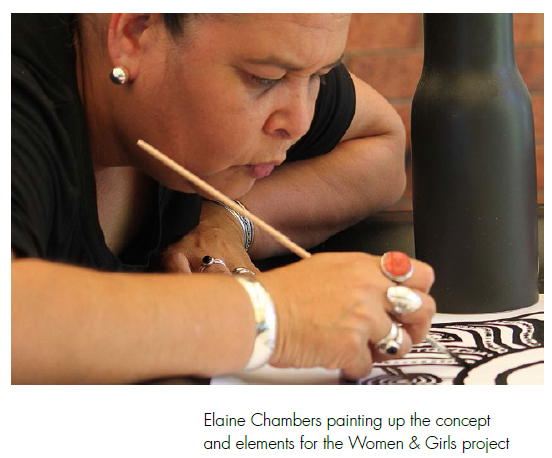 Moving towards the centre the four smaller circular motifs represent both Aboriginal and Torres Strait Islander Women and Girls who are effecting change today. The cross-hatching brings both culture and generations together. The blue wavey lines that connect them represent the knowledge of the past and knowledge of the present coming together - (knowledge from both freshwater and saltwater country). The white connected circles represent our support networks. The smaller circles that surround the central circle are meeting places that represent different locations throughout the country where discussions are held, knowledge exchanged and changes are made. The central circle represents these discussions and changes, the pathways that flow out towards the bottom of the artwork represent the continuing journey and the knowledge of both Aboriginal and Torres Strait Islander Women and Girls and how they are determining their futures together. The flowers represent these ideas growing and blossoming for future generations to be guided by and benefit from. The Australian Human Rights Commission has developed the Wiyi Yani U Thangani (Women's Voices) project to engage Aboriginal and Torres Strait Islander women and girls across the country in the form of an interactive website. The project artwork has been developed by Elaine Chambers in collaboration with Riki Salam for We Are 27 Creative, the following presentation shows the artwork development and key elements to draw upon. The Project builds on the 1986 Women’s Business report, and reflects on the status of Aboriginal and Torres Strait Islander women and girls’ over the last 31 years. Through enaging with our history we can grow together stronger for the future, the key to empowerment and the vision of the AHRC. Elaine has a wealth of knowledge and feels empowered to share her creative vision for such a meaningful project that will allow a voice to travel the country through the visual language of art and design repectfully created in collaboration. Hi, my name is Elaine Chambers-Hegarty and I am an Indigenous Graphic Designer and Artist - with my cultural links to the Koa and Kuku Yalanji people. My parents were both born in Cherbourg Qld, after their parents were relocated there, under ‘the act’ in the 1900’s. Both my parents and my grandparents, are my inspiration! They have always encouraged me to shoot for the stars or to have personal goals, and to always show respect and be proud of my heritage. Their kind and nurturing ways have been a foundation in my life. Family is very important to me, and my caring husband and our amazing daughter, complete my world! I was so blessed to inherit my Dad’s creative genes. This artistic ability and my love of computers led me to pursue a career as a Graphic Designer straight after I had finished school. It has been such a wonderful profession and one I have thoroughly enjoyed for the past 29 years. My work has been with News Media for most of those years, winning Newspapers highest achievement award - a PANPA Award for Creative Excellence, and in 2015, l won the NAIDOC poster design competition. But one of my great loves is creating designs for my people. Many of my family are artists, and I am lucky to have inherited the creative flair as well. Always doing well from school in Art, and painting or sketching whenever possible. My greatest reward is in the happy response I receive, when I have been able to translate someone’s concept/story into a creation that can be printed onto whatever medium, they want. It makes me proud to be part of bringing their story into a creative design. I love having the chance to pick up the pencil and the paintbrush and paint again and transfer my artwork into creations that can be utilised on multi-media platforms. My Indigenous heritage and my generic creative abilities, coupled with years of experience in the graphic design industry - enables me to create something to suit the style of any client who requires some creative guideance. 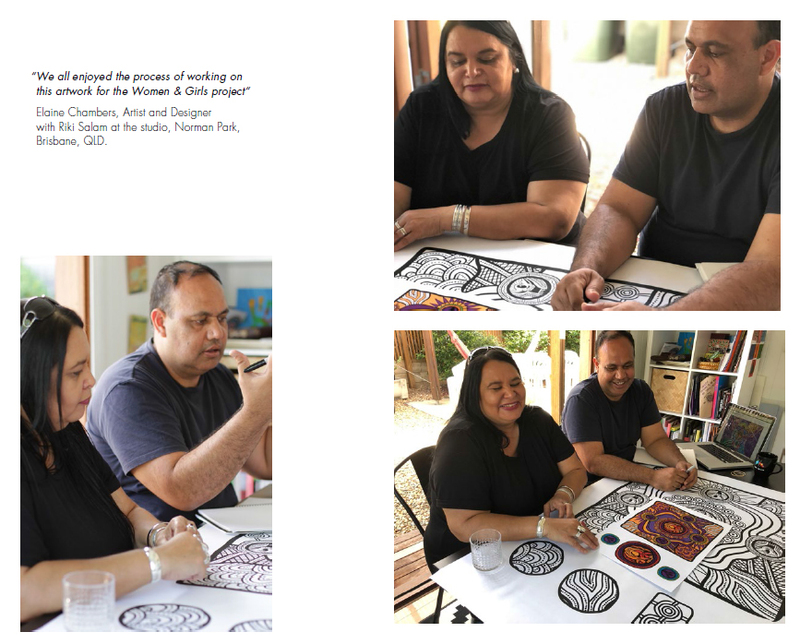 Riki is an accomplished artist and graphic designer with over 20 years’ experience, specialising in contemporary Indigenous art, design and communications. Born and raised in Cairns on Yidindji land, Riki has connections to Muralag, Kala Lagaw Ya, Meriam Mer, Kuku Yalanji peoples on his father’s side and the Ngai Tahu people in the South Island of New Zealand on his mother’s side. Educated in Cairns and Brisbane, Riki has worked on high profile projects across corporate, government, and not-for-profit sectors in Australia and internationally. We acknowledge Aboriginal and Torres Strait Islander peoples as the Traditional owners of country – the land, the skies, the seas and the waterways.